Helically wound extension springs with adjacent coils being kept together by initial tension and hooks on the ends to be pulled apart/extended. Helical extension springs are installed and used for several different applications. You can find them in trampolines, exercise equipment, valves, and even on screen doors. The function of helical extension springs is to pull back on the object which was pulled by a force thus causing it to extend. To design a helical extension spring, you may use our helical extension spring calculator, Spring Creator. 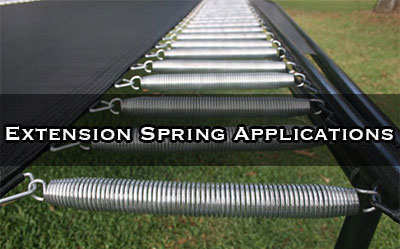 Spring creator will require you to choose a specific hook type and enter your helical extension spring’s dimensions. The hook types to choose from are shown as icons so you can differentiate each one and make the best choice. There is also a “How to Measure Extension Springs” diagram which you may follow to distinguish each spring dimension. Once you click on “Calculate” you’ll get a full spring analysis based on the hook type, dimensions, and material you chose. Helical extension spring force is based on the dimensions and material type of your spring. This is known as spring rate. There is also the force that keeps your helical extension spring’s coils together known as initial tension. Initial tension will be an additional force to that of the working loads calculated based on your spring rate and distance traveled. For extension springs, when you calculate the working loads, you first multiply the required load using the spring rate and travel and then you add the initial tension. Helical extension springs have an elastic limit based on both the spring’s dimensions and the stress on the hook. Exceeding the elastic limit by either applying more force than the maximum load considering hook stress or extending your spring further than the maximum travel considering hook stress will cause your spring to take a set, or it can cause for the hooks to bend or break. These excessive amounts of load and travel will cause helical extension spring failure. 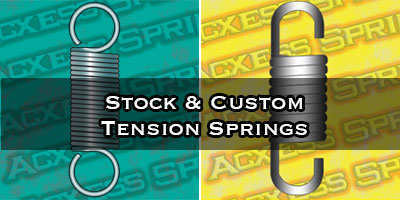 Helical extension springs are sold both from a stock spring catalog and can also be ordered to be made custom. In most cases, when generating a helical extension spring design, you might be able to find a similar helical extension spring in stock that’ll work just as good in your application. If this isn’t the case and either you have very tight tolerances or are looking to order high production quantities, you may also order them and have them made to meet the dimensions you specified. When helical extension springs are being manufactured, whether they are stock or custom, they are subject to standard commercial tolerances. This means that a dimensions might be a bit larger or smaller by a couple thousandths of an inch but it shouldn’t affect the way your helical extension springs will work in your application.